Kimolos is the only one of the three islets off Milos that is inhabited. 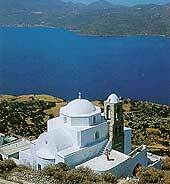 In fact it is the smallest of the inhabited islands in the Cyclades with a surface area of only 36 square kilometres. The Chora is an uphill 15 minute walk. Here you will find a couple of tavernas, shops, an OTE, a post office and an archaeological museum. 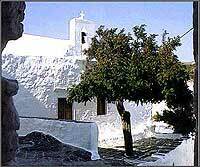 Near the town there is a kastro and the 16th century church of Chryssostomos. The remains of the ancient city of Kimolos and the medieval town with its defence walls stand on the summit of the island. Further away, the remains of a Venetian fortress, now called Paleokastro, can be visited. Those in search of a quiet beach should visit Alyki. Very close to Milos the island of Kimolos where the predominant colour is the white. This is where chalk is produced. The necropolis found at Elinika, in the south west of the island, and the remnants of the ancient city of Kimolos on the islet of Agios Andreas are testimony to habitation as far back as the Mycenean period. Much later in the Middle Ages, pirates used the well concealed caves of Kimolos as places of refuge. In general terms the history of the island has been that of Milos. From the quiet harbour of Psathi a road leads uphill to the capital of Kimolos or Hora, where almost all the islanders live. The houses in authentic Cycladic style are clustered around the nucleus of the castle, which is divided into two settlements, the Messa Kastro (inner castle) and Exo Kastro (outer castle). In the former the outer walls of the houses form a defensive wall with loopholes for windows and four entrance gates. The overall impression is of a painting in white against a blue black ground. Flowers are grown in all the courtyards and the alleyways are cobbled. Prassa in the north of the island is where the chalk is mined. There are also medicinal springs with sulphurous waters. In general the island has superb beaches and would be an ideal spot for those who are fond of quiet and solitude in an idyllic setting.